A celebration cake ade from three of Englands finest artisan cheeses. To serve approximately 25 people. 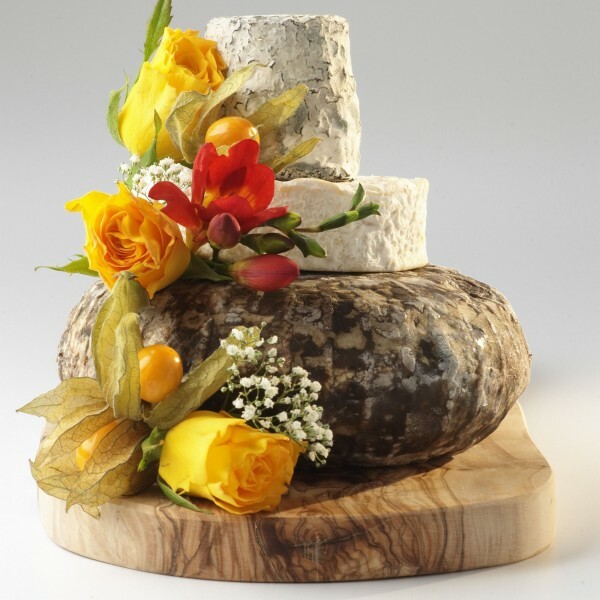 Ideal for the smaller celebration, wedding or party of cheese lovers, three contrasting tiers of some of the tastiest artisan English cheeses. To serve approximately 25 people. The diameter of the base cheese (Barkham Blue) is approximately 17cm. Dorstone Ash min wt 180g x 2 (only 1 shown) - A full flavoured goats milk cheese that has been rolled in ash. Dense in texture with a creamy, slightly salty lemon flavour. Tunworth min wt 200g x 2 (only 1 shown) - A hand ladled, soft and creamy cows milk cheese from Hampshire with a distinct nutty, mushroomy flavour. Barkham Blue min wt 1kg - A creamy, slightly open textured cheese with a rustic rind and a yellow, moist interior streaked with blue veins.